Today's negotiations in Greece on the creation of a government of technocrats have broken down. Talks will resume tomorrow morning, but only in order to appoint a caretaker cabinet which will remain in office until new elections take place - in all likelihood as early as mid-June. Although widely expected, the outcome of today's meeting is going to create further political and economic uncertainty over the future of Greece in the eurozone. So what could happen now? First off, it's by no means certain that a stable government will come out of the next elections. The latest polls indicate that left-wing SYRIZA could be the biggest party, but it would still have to form a coalition government. 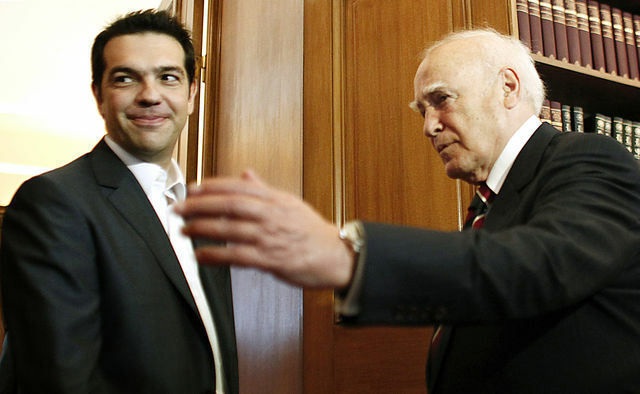 However, following the latest tough round of talks, the outspoken leader of SYRIZA Alexis Tsipras (in the picture with Greek President Karolos Papoulias) doesn't seem to have many friends - the Communist Party has ruled out a left-wing coalition since the very beginning of the electoral campaign, and Democratic Left leader Fotis Kouvelis said yesterday that he would no longer cooperate with Tsipras, even after new elections. On the other hand, Tsipras has repeatedly said that he doesn't want to become a 'complicit' of New Democracy and PASOK - the only two Greek parties that insist on the need for Greece to stick to the EU-IMF bailout programmes. Needless to say, this would complicate Greece's position vis-à-vis its eurozone partners. As Eurogroup Chairman Jean-Claude Juncker told reporters in Brussels yesterday, there could be some room for Greece to negotiate a relaxation of its deficit targets if a serious new government can be formed. As we pointed out here, Greece may well be heading towards a series of inconclusive elections. This would make it very difficult indeed for Germany and the others to justify the disbursement of future tranches of bailout money. Greece's euro exit is becoming increasingly likely - not just because it's being talked about by a growing number of top European politicians - although we still think that Greece's anti-bailout parties may ultimately soften their stance, potentially paving the way for a compromise. What's most interesting is the fact that figures are being put on the impact of a Greek euro exit (and consequent default). A couple of hours ahead of Francois Hollande's inauguration ceremony, outgoing French Economy Minister Francois Baroin told Europe 1 that Greece's euro exit and default "would have a net cost of €50bn" for France, "plus the debt held by banks and insurance firms in their portfolios." Le Figaro did its own estimates, and put the cost at up to €58.5bn - that is, €895 per Frenchman. Quite a busy eurozone day. As usual, you can follow our live updates on Twitter @OpenEurope, and continue to check out our blog for updated analysis. The pricetag put on an exit is imho purely a bookkeepingtrick. The country as well as its banks and its CB are bust. So from all the money owned likely even in the EZ and with the Euro only a fraction will come back. The situation will most likely be somewhat worse under the Dragma. Probably something like iso 20% back 10%. But the major part should by a proper businessman already have been written off. With the IMF being senior basically all money that is sent now to Greece (or via Target2) can be written off. For bookkeeping purposes this has however not happened yet. As well as for European safety net and EZ seperate country balances. But no normal businessman will pay more than say 20-30% for Greek debt (which is btw basically totally based on the fact that there are EZ/EFSF/ESM/ECB and that kind of implicit guarantees. It is pure windowdressing. It won't come back whether Greece stays in the EZ or not. Surely the issue now is not if but when Greece leaves the Euro, more importantly is the exposure that the banks in other of the PIIGS countries have to Greek debt, is this exposure enough to trigger technical defaults and perhaps mean that other countries have to leave the Euro. Are there plans for a number of counties to leave, how will the IMF and the European financial houses mange such an event. Question, I understand that if a country leaves the Euro they also have to leave the EU, is this correct? The Greek debt with Southern EZ banks is marginal (compared to the amounts discussed in this case). So contagion via this road will be marginal as well. Debt by other foreign financial institutions is also small compared to amounts discussed (and most not in the South), banks/countries of residence should easily be able to cope with that. Contagion some people are afraid that markets will not trust the other PIIGS. This is at a bad moment, markets are nervous and Spain and Italy are already pretty poor. Problem being they donot trust them now as well. So the alternative would be what we see now de facto ECB and the EZ North taking over the PIIGS debt. In Greece most has already been taken over by ultimately the northern taxpayer. Likely a Greek exit will make this somewhat worse (especially at the wrong time (like now)). It simply doesnot look like countries like Spain (and to a lesser extent Italy) will be able to get their economies running again anyway without huge 'overborrowing' (their 'businessmodel' in the EZ). So at the end of the day they most likely will go the Greek way, but not now. Might be positive for the Northern taxpayer that there is a forced probably exit before all debt is taken over. It would be much cheaper for Europe if Greece left EMU but the cost for the Greek people very high. However there is no doubt, Greece will leave EMU but there is no reason for them to leave EU. Expect a stream of refugees!